Unity (APNU), David Granger, of ongoing protest action being spearheaded by his political party in response to the move by President Donald Ramotar to prorogue the Parliament on November 10, last. Granger, who was at the time taking time-out from a protest on Vlissengen Road, just outside the Office of the President complex yesterday, to speak with media operatives, is of the firm belief that it has been protest actions that have served to even prompt a response from the Organisation of American States (OAS). In a press statement from the Washington, USA-based organization, Secretary General, Jose Miguel Insulza, took note of Proclamation by President Ramotar to prorogue the 10th Parliament. A lone protestor exemplifies the silence of Parliament by scotch-taping his face. As a result, he shared his conviction that with more information the public as well as civil society organisations will be better informed, thereby, allowing for a united decision to be made to “put pressure” on the PPP to reconvene Parliament. “I have not heard any voices outside of the PPP that support the prorogation of Parliament. Only PPP diehards have been supporting that call…You speak to any civil society organisation, business organisation, they all are calling for the reconvening of Parliament and getting on with the business,” the APNU Leader asserted. The Opposition Leader is not at all worried that the protest action will cause some level of uneasiness in the society even as the Christmas holidays near. “The people know that today is the 25th of November and they know that on the 25th of December they will be celebrating Christmas…They know that today they are protesting for the greater good (but) in the final analysis we are going to have a system of governance in this country based on the Constitution; a system of governance based on the representation of the people…This is what they are struggling for; they are not struggling for Christmas, but a good future for Guyanese,” Granger intimated. He pointed out that the current Speaker of the House (Raphael Trotman), a former AFC leader, could only have been elected because there was collaboration between APNU and the AFC. And from that time on, he noted, the two parties have had cordial and collaborative relations. “I don’t know where this talk about division is coming from,” said Granger, as he made reference to the presence of executive members of the AFC being present at a recent APNU rally at the Square of the Revolution. “The Chairman of the AFC (Nigel Hughes) was present, the General Secretary of the AFC (David Patterson) was present and the Chairman spoke at great length, and he was well received by the APNU audience which had gathered there, and these things could have only been possible if there was collaboration…He was not an intruder, he was not a ‘cochore’, he was greeted as a partner,” Granger stressed. Collaboration between the two parties was also evident when they passed the Bill to have local Government Elections which was proposed for August 1, 2014. 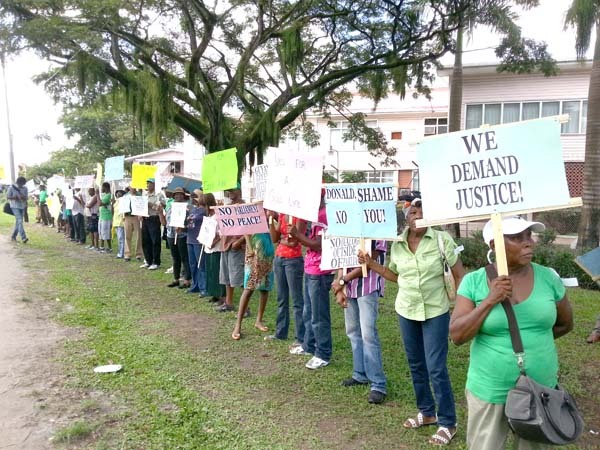 Although there was no evidence of AFC executives at yesterday’s protest, there were, however, scores of persons armed with placards lending their support to the APNU-spearheaded protest. 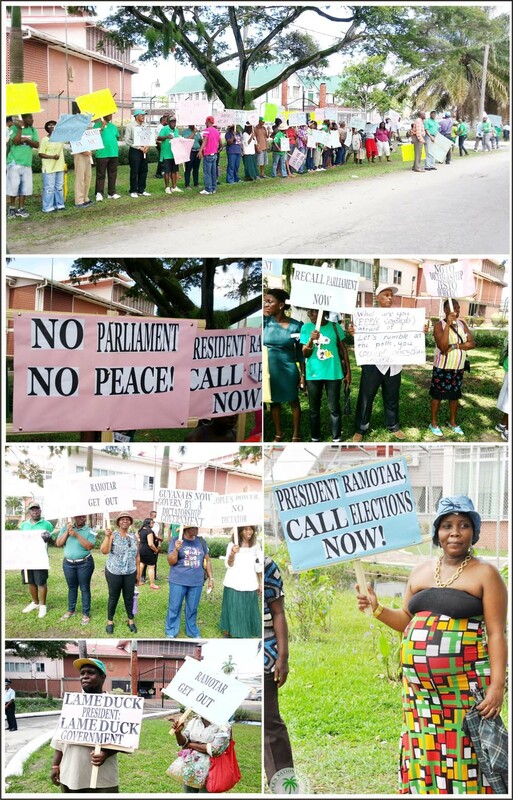 Aside from Granger, there were several APNU executive members marching along and chanting slogans to emphasise the need for democracy to prevail. And even as APNU’s protest commenced at 11:00 hours, a one-man silent protest had started since around 08:00 hours on the opposite side of the thoroughfare. 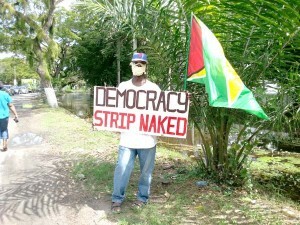 The lone protestor armed with a Guyana flag and a placard bearing the words “Democracy strip naked” sought to emphasise silence and also attempted to obstruct his identity by covering the majority of his face with scotch tape. He however, in a brief comment to this publication said that his action was also spurred by the move to prorogue Parliament. 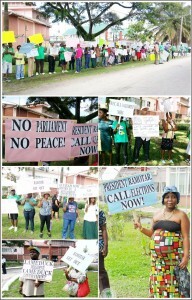 And like APNU, the lone protestor also vowed to continue this action until prorogation of Parliament is brought to an end.